This week is a Completionist Poll! If you're not familiar we've been running weekly polls where members of the forum share their opinions on ownership. This week we ask for your opinions of owning: Abbots. 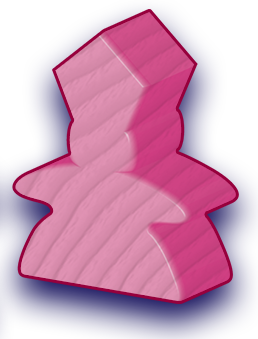 As you probably know, Abbots are a meeple expansions introduced in the boxed set of Carcassonne II. Some would say they have no place in Carcassonne, others need them even without Carcassonne II, while others are happy to use them in Carcassonne II alone. Then there's the Grey Abbot - which doesn't officially exist because that player colour has been revoked in Carcassonne II - forcing members to create their own. This was the advice I received from Cundco when I tried ordering one. Obviously, some of you play with alternate colours too and as yet, there are no Abbots for these! No doubt there's some permutation I've not marked - seems to happen most weeks - let us know how you voted below! I think you don't need Abbots. They fit nicely in Carcassonne II but are not needed in Carcassonne. Perhaps if they had been released as a separate expansion for CI, they would have a place, but as they only exist in CII, it's hardly reasonable to expect players to buy this just to get hold of them. Is what I wish I could say. I own Carcassonne II, and abbots in purple, pink, orange and white. I didn't buy it just for the abbots, although they were a large part of it. I would love a grey abbot and I can't stand the idea of having an incomplete player set, but as it seems unlikely I'll just have to replace grey with something else as the 'standard' sixth player set. Probably purple, as that would make the phantom fit. I need Abbots to use with Monasteries in Germany. Since gray is not an official colour, it's only fair to state it's not needed for the official completion collection. I have recently decided to fully consider Carc II as a separate set, so I will only play with the abbots when I play with the new art. I'm therefore happy with the default colours including pink. I do actually have a grey abbot though, which I painted from a black one. I made this before deciding that the too collections were separate! I use Abbots with Carcassonne II and also as Abbot on a German cloister to make them an Abbey. I use abbots with Carc I and Carc II. If playing a larger game I usually mix the Carc I and Carc II tiles. I also let the abbots claim shrine and abbey tiles, or any other cloister-like tile. I like playing with the gardens so the abbots have more of a function. Sometimes we also play that the abbots can treat vineyards like gardens and be played on those as well. On a side note, Princess and Dragon is the only full-size expansion that I don't have yet. I've had the opportunity to buy it (shipped from Germany) but I have not. I'm in the US and I'm waiting for the Carc II version of it to come out here so there will be gardens on some of the tiles. I don't currently own enough Abbots to really do much with them. I think I have three official ones and some plastic grey ones I got last year from here. However, I would probably just use the German Monasteries abbot rule that's been fairly universally accepted now. In fact, I would use those for any/all cloisters regardless of the artwork. That way any one player can only ever have one cloister scored like a German Monastery. If more tiles with the Vineyards artwork from Hills & Sheep were available, I'd probably use those as a stand-in for the Gardens. I voted for the second option, but I will say that I'll be OK if I don't get them. I don't intend on getting Carcassonne II and so I don't think they'd be useful in a game without the gardens. That is of course unless I don't understand the rules for them. At any rate, I'd rather wait until they are available in all colors. 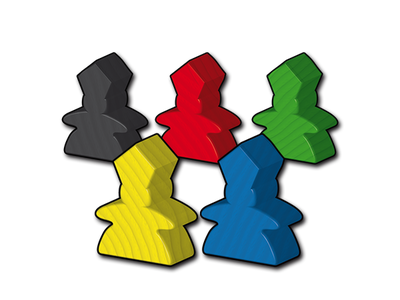 Speaking of lime green meeples, are they available in full sets, or just the standard meeples? I think they'd be interesting in Carc I game. They are specialist meeples for monasteries. When you get blocked round a monastery you pull back the abbot and it can move onto its next calling. If one was really desperate for gardens one could mark the relevant tiles. I voted that I'm not sure where mine are but that I think Ailurus has them. In fact, I told Tom this when we were discussing this during the week so I've a feeling this option was especially for me. Apparently I'm not the only person to have selected it though, which is worrying, as it suggests that Ailurus has got someone else's Abbots now as well! Just the standard meeple sets as far as I can tell from here. Perhaps Ailurus voted for that option too? It sounds like you may already be standing at the edge of that slippery slop. A wiseman of this forum (Rosco) once said: "What does someone collect once they have everything?" "I suppose I should just start my second set"
Don't worry about that fnishing that sentence too, you missed the fullstop at the end!